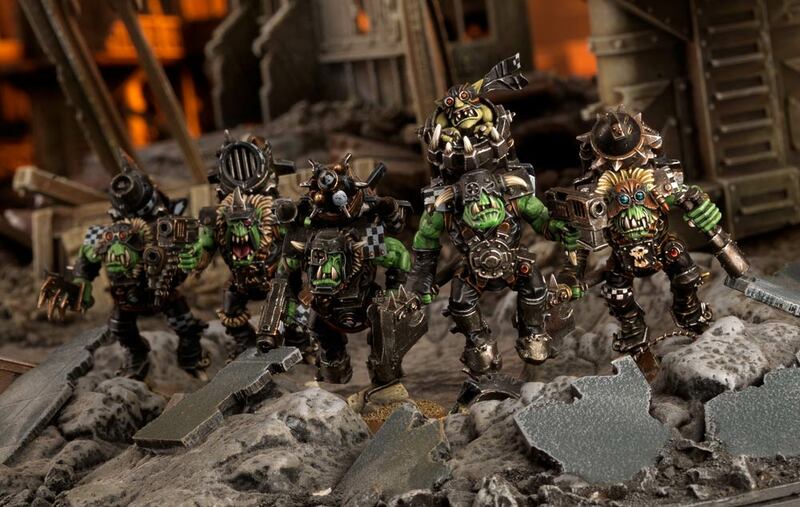 Die ersten drei Clans der Orks der fernen Zukunft von Warhammer 40.000 wurden auf der Warhammer-Community bereits vorgestellt, hier folgen jetzt vier weitere. Orks aren’t just obsessed with violence – many also find the very act of going fast a rapturous experience, and none more so than Speed Freeks. 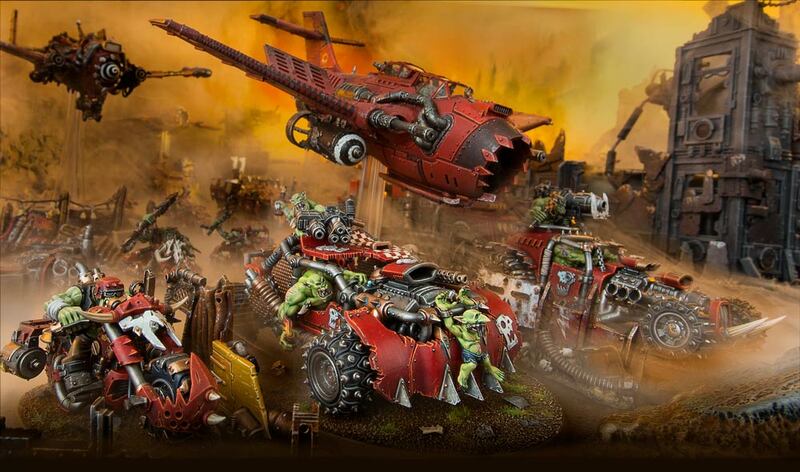 Indeed, such Orks will seek to combine their two favourite pastimes of racing at high speed and mindless carnage, forming a great Speedwaaagh!of smoke-belching racing vehicles with which to roar into battle, full throttle. 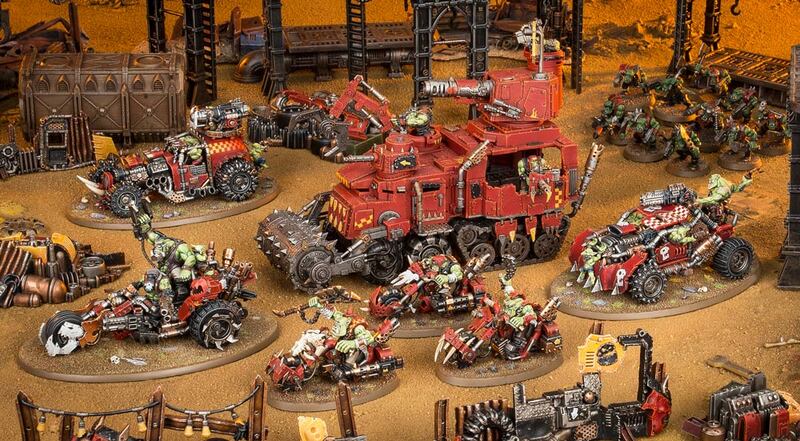 Foremost among these speed-worshipping Orks are the Evil Sunz – firm believers in the old Ork adage that “red ones go fasta” to the extent that they paint all of their vehicles (and sometimes even their ammunition) red! Yep – for the Evil Sunz, the red ones really do go faster! By choosing Evil Sunz for your Clan Kultur, you’ll get an army-wide speed boost (even for your Infantry units! 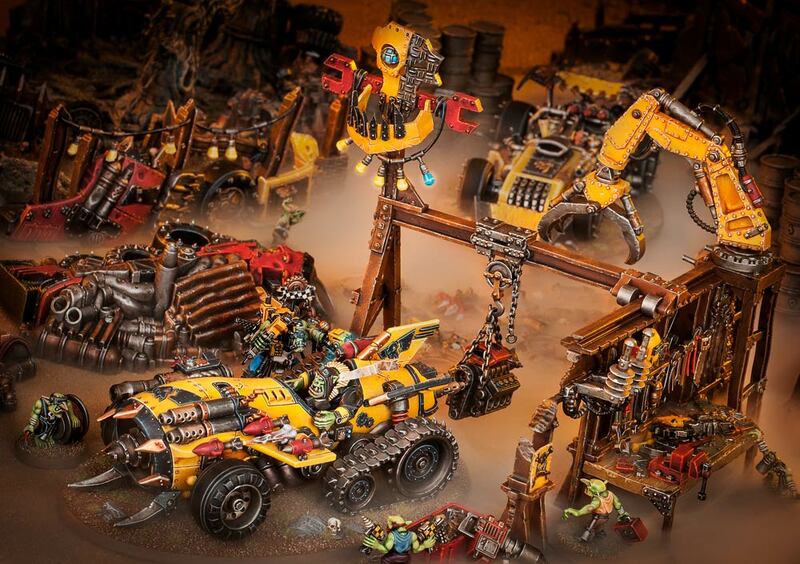 ), with a particular turn of speed for your Speed Freeks units – that’s Warbikers, Deffkoptas and buggies such as the Kustom Boosta-blasta and Megatrakk Scrapjet. You’ll also be able to shoot Assault weapons without penalty when you Advance, letting you maintain a semblance of accuracy as you close in on your enemy. Just imagine combining this with a Stompa for a guaranteed 18 shots with the Deffkannon – and a chance at improving its Damage in the process! The only downside is that a model can’t shoot in the turn it receives a Kustom Job – but even so, you’ll find them absolutely invaluable in a mechanised army. 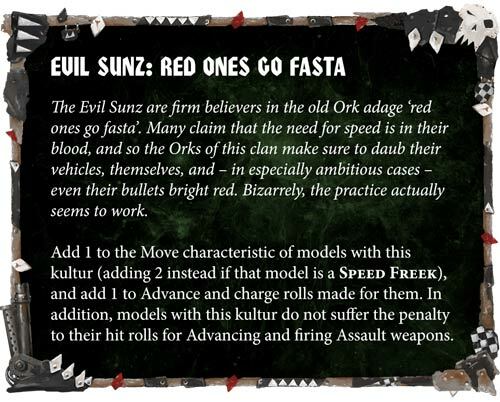 For a mechanised Ork army that’s fast, furious and unstoppable on the move – or for as good an excuse as any to paint everything red – choose Evil Sunz for your Clan Kultur. And if you like the threat posed by a potential mass charge in the first battle round, an Outrider Detachment of Evil Sunz is the perfect answer. We’ve got more previews coming, and soon – check back tomorrow for our preview of the avaricious Deathskulls. Welcome to Clan Fokus – a new series on Warhammer Community where we’ll be taking a closer look at all the new Clan Kulturs in the new Codex: Orks. These powerful special rules let you tailor your play-style and offer huge benefits to nearly every unit in your army. We’ll be previewing a new Clan Kultur every day this week – looking today at the Deathskulls. You never really own a gun in the 41st Millennium – you merely look after it for a bit until an Ork takes it from your cooling corpse. 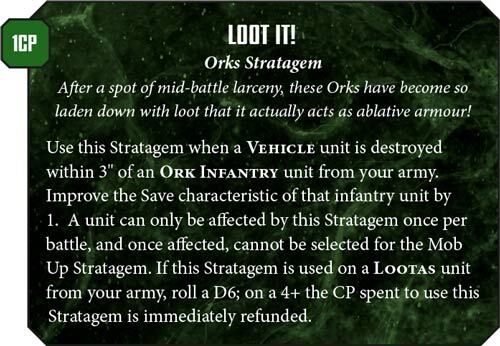 No Ork clan demonstrates this shamelessly larcenous quality better than the Deathskulls – avaricious, superstitious Orks who’ll steal anything that isn’t nailed down… after which they’ll steal everything that is nailed down. Including the nails. 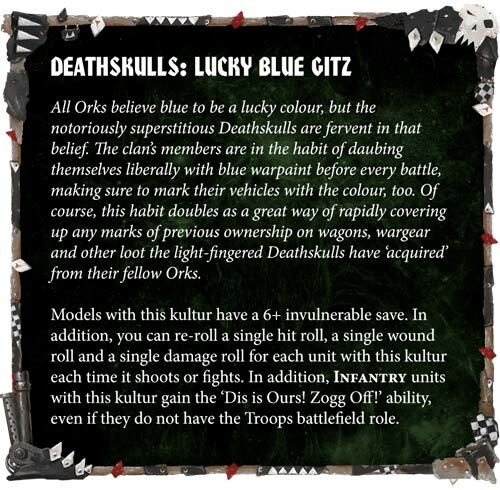 Blue paint is actually lucky (well, for Orks, anyway). 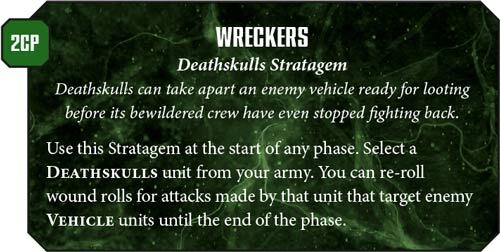 In fact, it’s so lucky that every Deathskulls unit gets a 6+ invulnerable save! From gaining a chance to save against those pesky lascannon shots on your Deff Dreads to adding a little bit more durability on your hordes of Boyz, what’s not to love? And you get a series of auspicious re-rolls whenever you’re shootin’ or krumpin’ stuff (all the better for lootin’ their gubbinz afterwards, of course). What’s more, having “Dis is Ours! Zogg Off!” – a rule that gives you priority when you score objectives – on no less than all of your Infantry units helps you keep a control of the battlefield. Lucky gitz indeed! The Deathskulls know better than any that to steal something, sometimes you need to blow it up first. That’s where Tankbustas come in. Like before, they get re-rolls to hit against all Vehicles but combine them with the Wreckers Stratagem and they’ll be smashing their way through Land Raiders, Imperial Knights and any other particularly durable targets with relative ease. 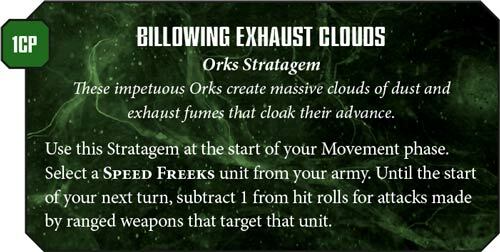 Tankbustas get even deadlier when combined with the Extra Stikkbombs Stratagem. By allowing every model in the unit to throw a Grenade weapon, you’ll be able to douse the enemy in Tankbusta bombs – a deadly deluge that few could hope to survive! As this Stratagem can be activated even when one of your own vehicles is destroyed, it can be surprisingly easy to utilise. 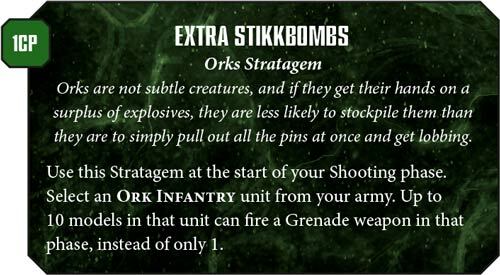 This Stratagem works for most Ork infantry, but is particularly useful with Lootas, who give you a chance to recover the Command Points you just spent on it! 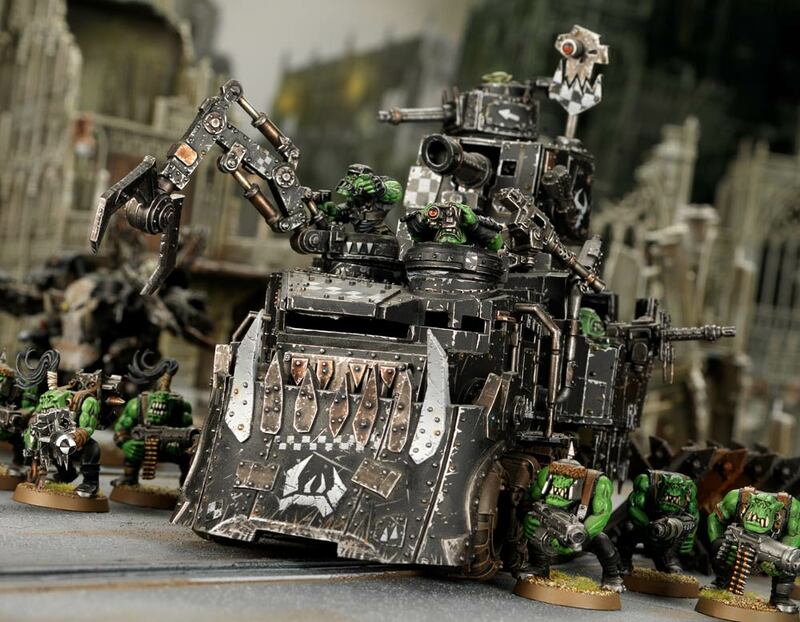 Scrapping vehicles, mobbing objectives and shrugging off krak missiles with nothing more than a lick of blue paint – the Deathskulls really are something. If you’re looking for a cracking all-round Clan Kultur, then like the Deathskulls themselves, you’re in luck! You’ll be able to get your hands on the Clan Kulturs for yourself soon, as Codex: Orks is available to pre-order tomorrow! 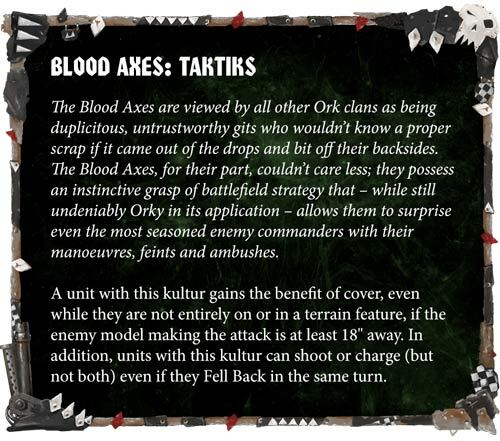 Welcome to Clan Fokus – a new series on Warhammer Community where we’ll be taking a closer look at all the new Clan Kulturs in the new Codex: Orks. These powerful special rules let you tailor your play-style and offer huge benefits to nearly every unit in your army. We’ll be previewing a new Clan Kultur every day this week – continuing today with the Blood Axes. Careful planning. Patient observation. An innate grasp of tactics, strategy and the finer arts of warfare. If they were anything other than Orks, these traits would mark the Blood Axes as natural leaders for their race – instead, their blatant disdain for the traditional art of running at your enemy and yellin’ has turned them into outsiders. Some Blood Axes will even work as mercenaries for particularly desperate and heretical Imperial commanders (though this is usually as a pretence to grab some humie guns, then promptly turn them on said ’umies). 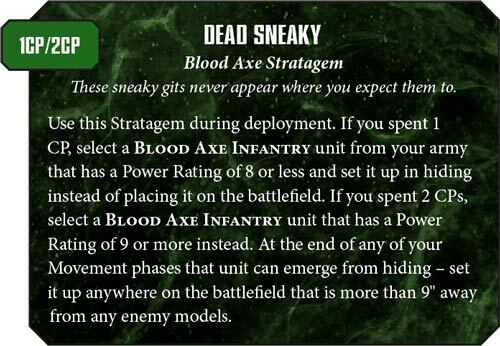 But how does the Blood Axes clan’s somewhat un-Orky grasp of tactics play out? The Blood Axes have a fantastic Clan Kultur that means that, as long as you’re far enough away from the enemy, you’re effectively in cover, offering anything from your Boyz to your vehicles a much-welcome boost to their saving throws. Should you want to get up-close and chop up your opponents, you’ll be able to slip in and out of combat at will to shoot or charge again. Not only is Boss Snikrot an absolute beast in combat, with a Warboss-level profile and the ability to make nearby units of Kommandos even more fighty (representing his infamous Red Skullz), but the new ability they share, Throat Slitta(s), is brutal – especially when considering that all Orks are now at least Strength 4. That’s a lot of potentially big or powerful units that can emerge from hiding to really bring the pain to your opponent – Nobz or Meganobz, we’re looking at you! And, of course, you’ll get to re-roll the ensuing charge dice thanks to their ’Ere We Go ability. Kunnin’ but brutal, right there. Stormboyz are simply brilliant in a Blood Axes army. 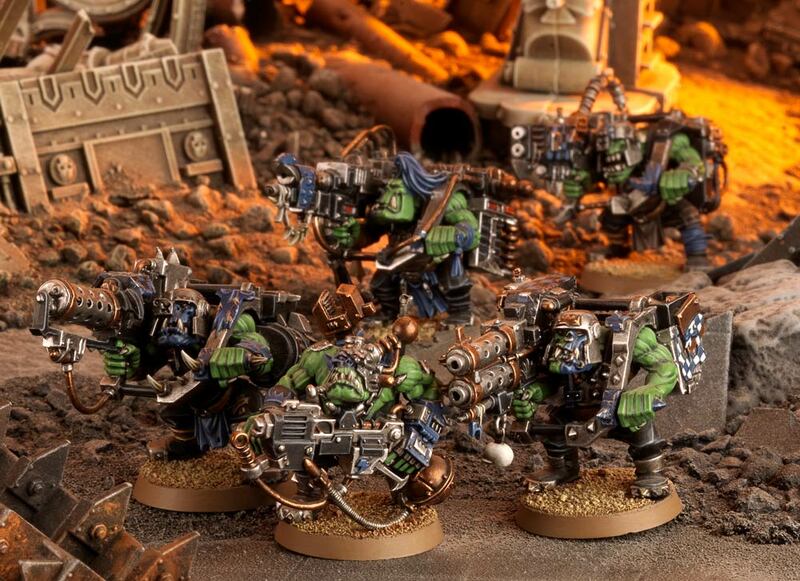 Already a staple of some of the most successful matched play Orks lists, these rocket-pack wearing boyz are about to get a lot better thanks to a new ability that lets them drop in like other jump-pack users. With the Blood Axes, you’ll want to drop in, charge, then retreat and charge again at the first opportunity. While you’ll be risking enemy Overwatch again, it’s usually worth the risk for the ability to fight first in combat. Just make sure the enemy unit isn’t armed with flamers of any kind before you do so – Blood Axes are far too kunnin’ to fall for that! Amongst the Orks, there are those who wander without clan or tribe, forging their own path between the stars. Some are the survivors of calamitous disasters that killed their mates, while others are eccentrics exiled by choice or by force from their peers. Gathering in roving hordes known as Freebooterz, these Orks turn mercenary, terrorising space, hiring themselves out to other Ork warbands and dressing even more outlandishly than ‘ordinary’ Orks. 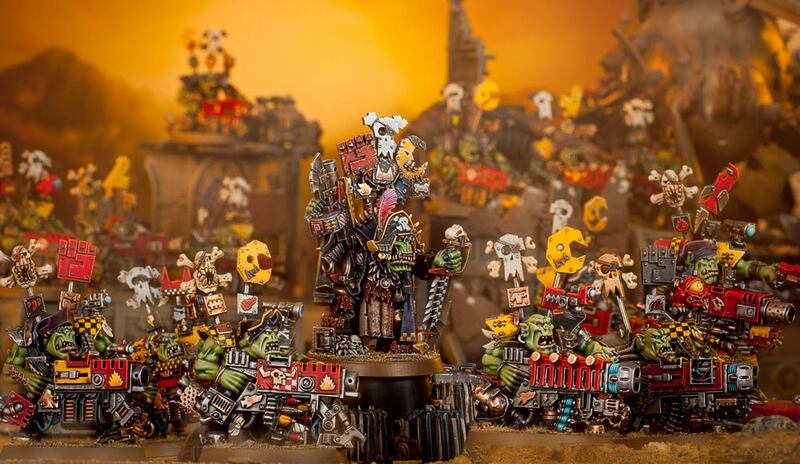 Flash Gitz occupy a special place in the new Orks codex. If you’re fielding one of the other clans, you’ll be able to include them in a Detachment without losing your Clan Kultur (though the Flash Gitz themselves won’t benefit from the Clan Kultur). However, choose Freebooterz, and you’ll get to apply your Clan Kultur to them as normal, representing their effectiveness when fighting with their fellow Ork pirates. 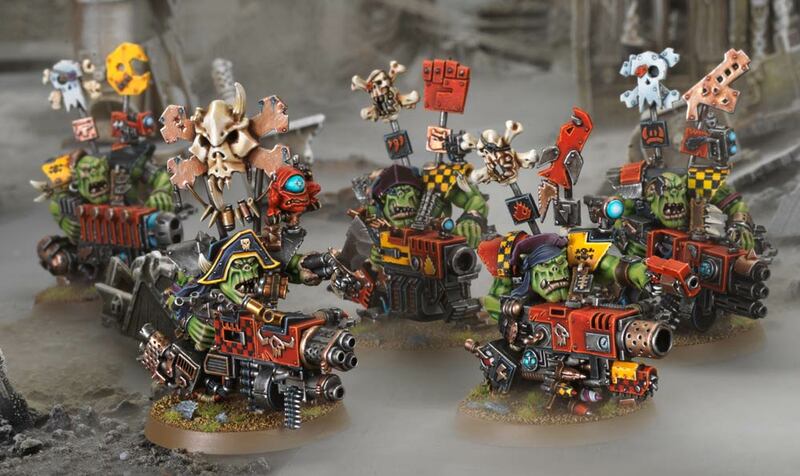 These guys are the premier dakka-delivery system for Orks and a unit or two are a must-have in any self-respecting Freebooterz army. 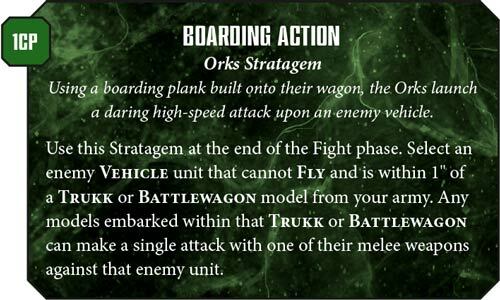 acks of piratical Orks using boarding planks to storm across and wreck enemy tanks as they pull up alongside them – is there anything Orkier? We think not! 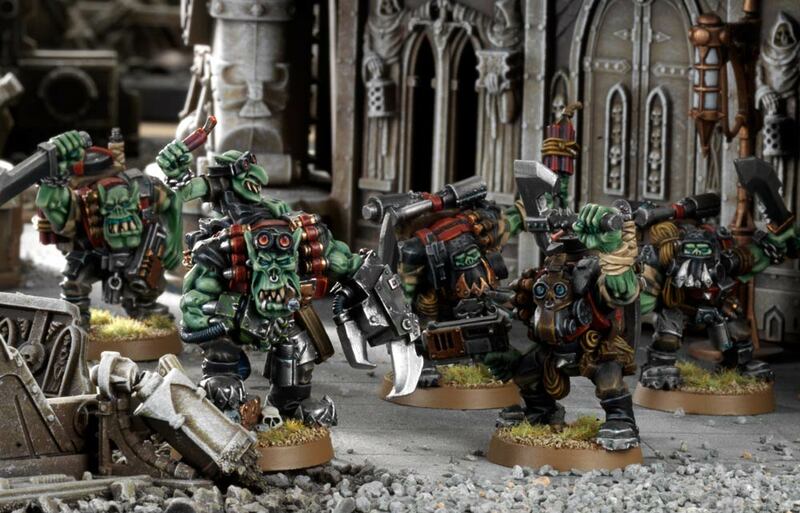 You won’t have to wait long until your Orks can go a-Freebootin’ – you can pre-order Codex: Orks today. Na ja, wenn man den für GW richtigen Clan wählt. Die BA haben mMn wieder nicht so doll abgeschlossen. Zurückfallen und schießen beim BF von 5. Wieder angreifen bei RW von 5/6? Und warum Deckung nicht unter 18“? Warum die Überhitzungsregel ohne den spaßigen Effekt von z. B. doppelten Treffern? Kampfdrogen bei Snakes? Grot-Schutzmauer, Mehä Dakka, Stärka, Panzarüstung, Rettungswürfe bei denen das Schutzfeld explodiert, Grotpanzer. Bosstangen die Trefferwürfe wiederholen oder den Schutz von Gork/Mork gewähren etc. Die Orks hätten ein bissel OP schon verdient. Ich warte mal ab bis der Codex da ist, besser als der letzte wird er ja. Einige der von dir aufgelisteten Dinge sind doch im Codex drin und mit OP liegst du nicht so sehr daneben. Einige Optionen und Einheiten könnten durch Erratas oder CA 2019 durchaus einen Nerv rein gedrückt bekommen.